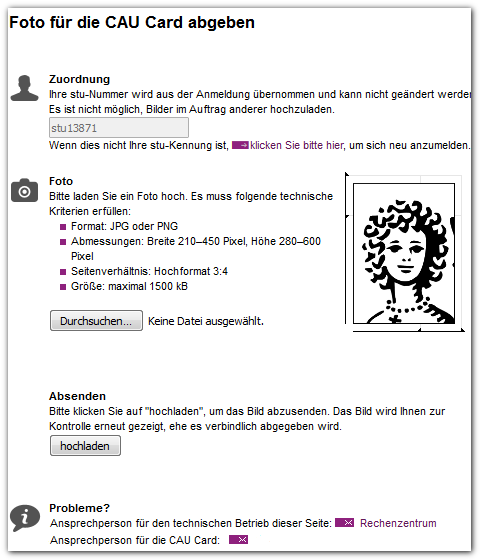 Under Photo you can see the requirements that the photo must fulfil. Please check in advance that your photo is sufficient for the specified requirements. You can find information on adjusting a photo on the CAU Card webpages. When you click on Search a standard dialogue will open. Please select the folder and file on your data carrier. When you have confirmed your selection the dialogue window will close itself. The file name will now appear next to the Search button. If a different file name is displayed, you can repeat the selection.